Spring is finally here, and what better way to enjoy the perfect weather than with a good run! I am personally tired of the typical light rail path run and was looking for some unique scenery to spice up my routine, so here is our favorite 5k/10k loop in Uptown. The 5k and 10k routes both start at Frazier Park in 3rd Ward, and if you are traveling here there is ample parking across the street. 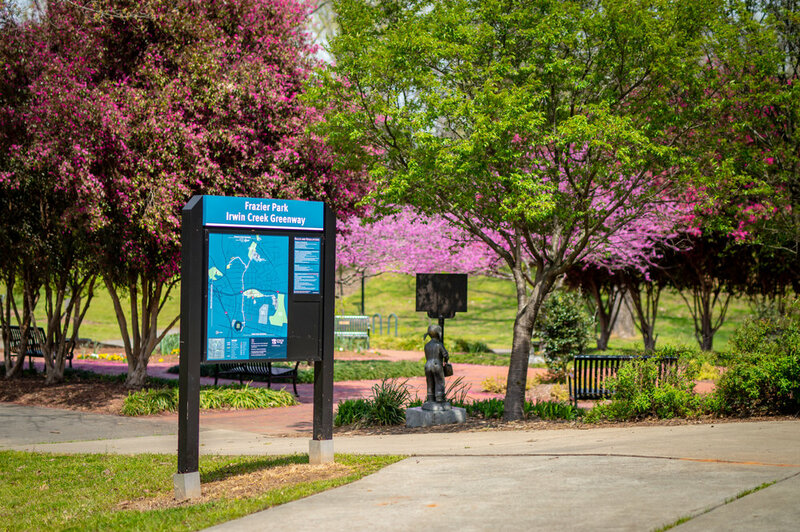 Along the route, you will get to enjoy some of the best sights Charlotte has to offer on a run, from beautiful cherry blossom covered greenways, to the high rises of uptown. This is a fantastic Queen City tour, So let’s get running! The first mile of routes follows the greenway path west out of Frazier Park and through the Wesley Heights neighborhood. Along this greenway are some of the best views of uptown that you have never seen, a stunning stretch of Cherry Blossoms, and the neighborhood Story Walk. Even if you aren't a runner this is a great walking trail to check out with your family on a warm spring day. Once you make it to the Story Walk the turnaround point is just ahead at Blue Blaze brewery, and if you are thirsty stop in for a pint. Pace Note: If you have a spare second take a detour and check out the Historic Wadsworth Estate. After the turn around the 5k route loops back through 3rd Ward, past the Carolina Panthers Stadium, to finish back at the start in Frazier Park. The 10k route splits off on another greenway towards Morehead Street, because who doesn't like to work a little hill into their runs every now and again. On your way to Morehead, you’ll pass by two of our favorite uptown hangout spots Town Brewery and Rhino Market. Keep pushing up Morehead until you reach Mint street, here you will turn left onto the Carolina Panthers stadium grounds for a shady tree covered section past the front gates. Keep following mint street up the road to BB&T Ballpark on one side and Romare Bearden Park on the other. If you need a break Romare Bearden Park is the spot with fairly nice public restrooms and water fountains. Pace Note: This section of Mint street is the finish to the Charlotte Marathon and several other races that take place in Uptown throughout the year. After catching a quick break in Romare Bearden park or snagging a fly ball as you pass the Baseball Stadium, the run heads up towards the heart of Uptown Charlotte and the crossroads of Trade Street and Tryon street. Running through the city is a blast, and weaving through the people on the sidewalks always seems to energize a run. Enjoy the sights and everything that uptown has to offer as you make your way to the 7th street and the public market. Just past the market is First Ward Park, where you can even stop for a quick workout session at the open-air gym. First Ward Park is the last stop on the Uptown 10k tour and is also a great spot for a pit stop before heading back to the start of the run at Fraizer Park. Now get out there and enjoy your run! And don’t forget! Perfect Pace CRC Educational Session on Running Form and Injury Prevention with Greenapple Sports and Wellness.